12 years ago today my life drastically changed. There was a baby. And he was mine. And I had to, like, take care of him and stuff. It was crazy, man. It still is crazy, if we’re being honest. 12 years of being a mama. It’s an amazing thing. 12 years with the absolute sweetest little boy I’ve ever met. I’m always telling people what a great kid he is, but I don’t think they fully get it. Really, you guys, GREATEST KID EVER. I love him to pieces, is what I’m trying to say. So, to make his birthday extra special, I served him up some Funfetti Cake Waffles for breakfast. With a big blob of ice cream and a healthy drizzle of chocolate syrup, natch. His day is off to a pretty good start. Happy Birthday, Elijah. Love you always, no matter what. 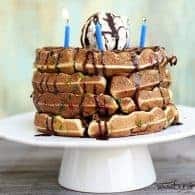 Cake mix waffles are a fun twist on dessert, but serving them for a birthday breakfast makes the day that much more special! Mix together the cake mix, water, oil, and eggs in a large bowl until well combined. 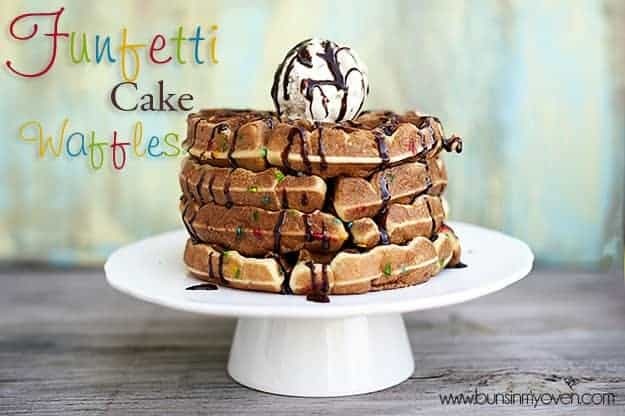 Drop 2 1/2 ice cream scoops of the cake batter into a preheated Belgian waffle iron and cook for three minutes. Use less cake batter if you're using a smaller waffle iron. 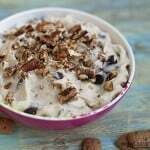 Serve with a scoop of ice cream and a drizzle of chocolate syrup. You are the best mom ever. Will you be my mom too? 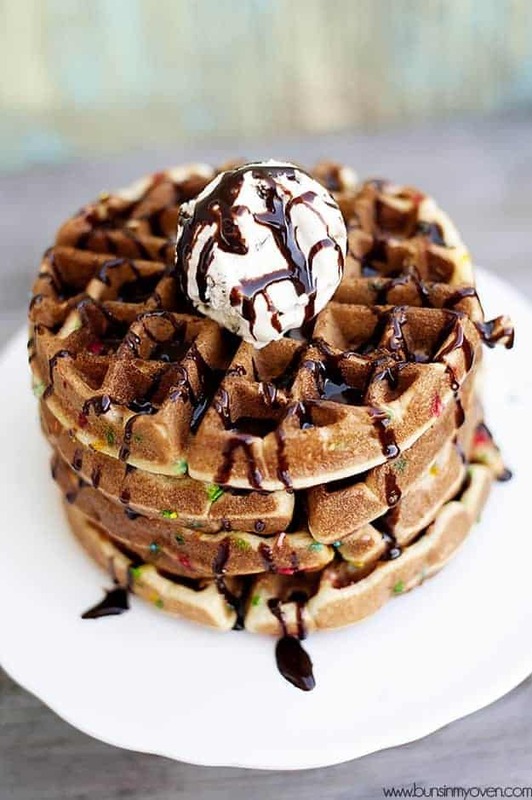 I want ice cream and sprinkle waffles for breakfast!!! How fun is this! 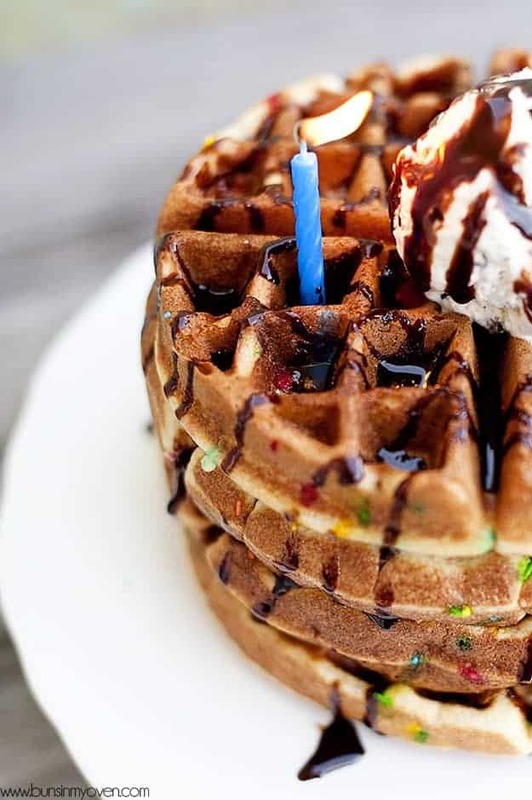 Almost a good enough reason to pull out the waffle iron! Wow, these look fabulous. 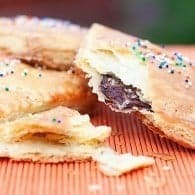 Mom of the Month award for these! 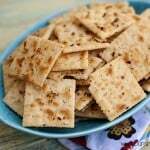 And your last post, those crackers, really want to try them! Have seen similar on Pinterest. They look so addicting! Talk about greatest mom ever. 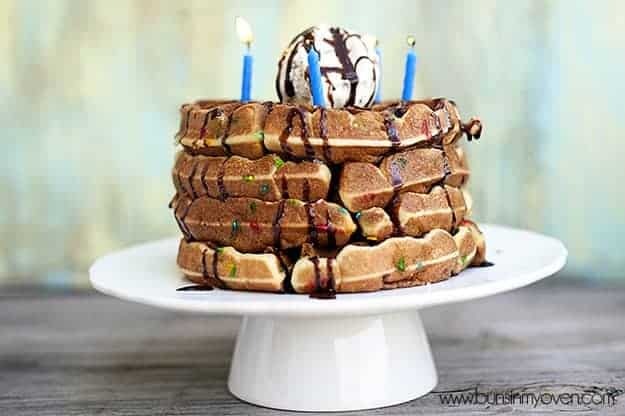 That is probably the most legitimate way to eat cake for breakfast, make it a waffle! Ohhh those look awesome. I could probably eat all of them !!!!!!! I love making funfetti panckaes for my 2 munchkins! aww you’re an awesome momma! This looks Amazing! I would love it if you shared this at my link party (first one ever) http://www.michellestastycreations.blogspot.com. Have a great day. Happy birthday, Elijah! PS – you just won best mom of the year award. Pingback: Friday Fun!! Friday Fun!! Love your blog – these look AMAZING! Making these tomorrow for my youngest kiddo’s birthday!! integrating your digital scrapbook designs into them. to an additional is not a a issue. will help visualize the items and colors in combination with the space. available to select the one that matches your preferences. This looks awesome! It’s also making me want to experiment with making waffles. 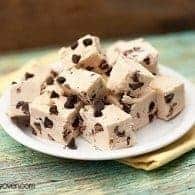 Do you recommend making these with solid ice cream only, or would ice cream with add-ins (like rocky road or cookie dough or half-baked) work as well as solids?Also, what is the consistency of the ice cream when you add it to the dough? There is no ice cream mixed into the waffle batter. This looks amazing!! 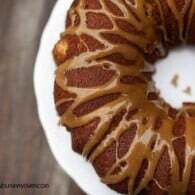 I am going to suprize my friend and make this for her birthday breakfast! I know she’ll love it because she absolutely loves waffles. 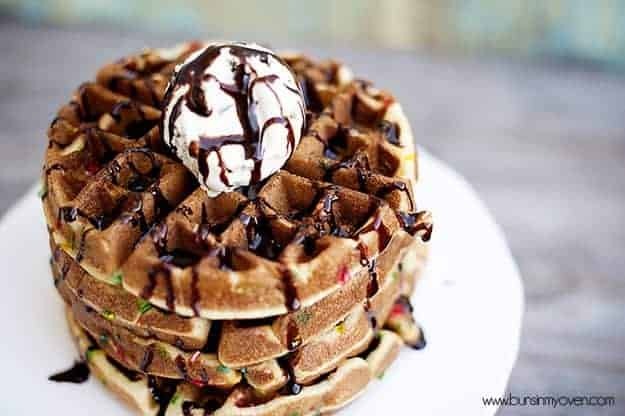 Pingback: 15 Waffle Recipes Every Breakfast Lover Should Know - How to do everything! Pingback: 15 Waffle Recipes Every Breakfast Lover Should Know - Snap Tips!